this outfit was very quick decision. I bought new pants in Lindex in beige color as I am lately being really obsessed about that color as you have probably noticed then add some cool swetcher with lace detail and sneakers in similar color. For explanation, I am just so sick and tired of black color and black clothes everywhere in stores. I am trying to fight it with using soft colors, let's see how long it will last me :D.
What do you think of that look? Let me know and thanks for sharing with me! Thanks for stopping by and sharing with me! showing you another efortless and easy look for weekend, shopping or just city stroll, as it was in my case. I paired black tight mini, loose comfy sweater and my fav boots and of course I had to add coat and scarf. Very simple and basic outfit when you are out of fantasy and wanting something safe. as of recently I have been really busy either with work or with household work. One could never believe how much of work woman has to do. I am more active on instagram, so I have been posting pics from our weekend getaway in Low Tatras in Slovakia, or from other hiking trips that we have been doing over the weekends. You can imagine that I am not wearing anything fancy, just outdoor clothes and no makeup, and honestly I have been enjoying that quite a lot. We try to plug out and connect with nature, :D if you get me. Look which I wore during visit of my loving hometown Martin, Slovakia is very simple and yet very cool, I would say. Especially thanks to the fur vest and an awesome bag, which was a present from my man. Could not love him more, right! Thanks for stopping by, and sharing with me! Hello to all of you who are eager to find out what I wore over last few weekends! As we were blessed with amazing indian summer here in Czech Republic, I could not be more happy than wishing to wear one layer less, but unfortunately the weather is getting a bit colder so right now you have to imagine these outfits with some coat on top. In both of the outfits plays the key role the loose cardigan with beautiful autumn colours. First option was worn to the technical museum, so I needed comfy shoes for long hours of walking and warm cardigan in case of too much AC which I unfortunately bare very poorly. I wanted to accentuate my waist so I put on my favourite belt on. Basic shirt underneath and nice stripy bag were just no brainer. The background is of the Ostrava technical open air museum, known as Dolní Oblast Vítkovice, where many festivals took place during this summer. My second outfit was more leisure appropriate, as I wanted to be super comfy. So I wore my new slip on shoes and black faux leather leggins and denim shirt which I found kinda cool. As the weather started to get old I just threw on this cardigan piece. This kind of outfit I usually wear when I go grocery shopping or for long walk in park. Let me know which one of these two outfits you like the most? I have my favorite already.,.. By the way what do you think of that leafy backround? Isn't it amazing??? another hat outfit. 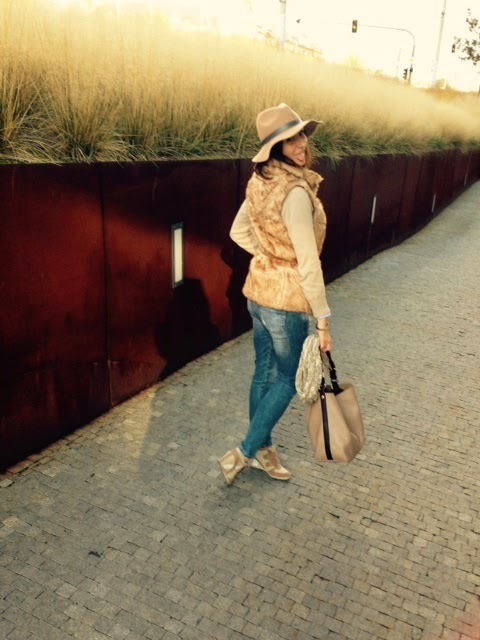 I am loving hats for fall, especially for fall, They kinda keep my head warm but I am still looking chic and having fun. There was even a girl asking me about this in a store while we were shopping with my sista. I was in search for a great faux fur vest with some zipper and a colar for ages, and especially the price was something was interested me deeple. When I checked the mail box there was a flyer from KIK, where I do not usually go shopping. But this time on the first page was featured this cute vest, as I have imagined it for such a long time. And nonethenless the price was awesome plus I have got a discount. Well that made my day definitely. I had a blast spending the beautiful weekend outside and with my family. What about you? How was your weekend? bringing you a casual look to either a weekend, shopping or travelling. I pair it with new slip ons, that I bought from one blogger here in Czech. I am still a bit concerned about the seize fit, but we will see. I love that cozy knit and that awesome scarf from H&M bought last year. Very comfy and cozy as mentioned already. Black trenchcoat for this weather and off to shopping. PS: There is ongoing sale on Mango, so go ahead and check it out! this outfit you have probably seen on my blog, but this time I had different shirt and cardigan underneath, which are not visible due to chilly morning. I love this combo of pants and fitted blazer and especially this Zara scarf from last season which transitioned the whole outfit to a different level. Don't you think so? This scarf is really a must for me for this season and for winter as well. Do you have any autumn favorite piece? Let me know, curious about that, thank ya! Classiana. Motiv Super a.s.. Používá technologii služby Blogger.